“CRITIC’S PICK: SMASHING…A tale of a romantic triangle where well-heeled people of artistic temperament pursue discreetly dangerous love lives.” – Ben Brantley, The New York Times. Click here to read Ben Brantley’s full review, which appeared in The New York Times on April 14, 2014, during the original run at Abrons Arts Center. – Helen Shaw, Time Out New York. Click here to read Helen Shaw’s original review, which appeared in Time Out on April 14, 2014, during the run at Abrons Arts Center. “Richard Maxwell’s new play is about myth, memory, and a house that never gets built…with characteristically clean lines and meditative pacing.” – Miriam Felton-Dansky, The Village Voice. Click here to read the full review, which appeared in The Village Voice on April 16, 2014, during the run at Abrons Arts Center. Isolde is a new American play about memory, identity, the ephemeral, and infidelity, written and directed by Richard Maxwell, “one of the few truly original experimental theater auteurs.” (Ben Brantley, The New York Times) In the play, inspired by the legend of Tristan and Isolde, the marriage of Patrick and Isolde appears to be happy. Patrick is the owner of a successful construction company and Isolde is a star actress. But Isolde finds herself increasingly unable to remember her lines. When she decides to build her dream house, her husband is eager to help. But the project is jeopardized by Massimo, an award-winning architect whom Isolde hires. Isolde contains explicit sexuality which some may find inappropriate for those under 16 years of age. Get a sneak peek look at the production below! 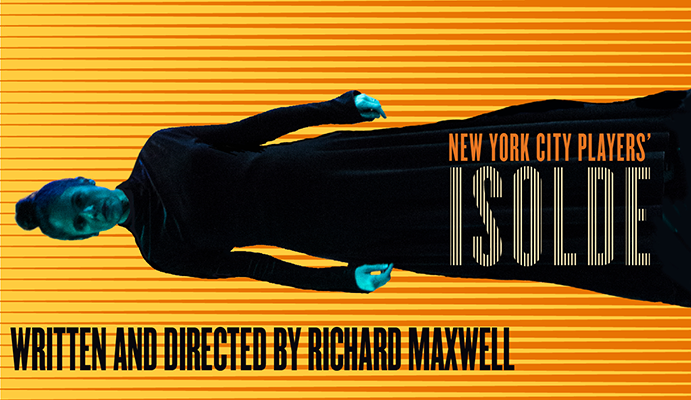 CLICK HERE to read the 360° Viewfinder production guide, with facts and perspectives on New York City Players’ ISOLDE. Isolde was developed in part at Theater Basel, where it received its first production in September 2013, and was later presented at La Filature in Mulhouse, France and at Abrons Arts Center in New York City.